(22nd February 2017) Innova Solutions Ltd, as the specialist tape and adhesive supplier to the sign industry, will be showcasing a range of their leading, pioneering products including pre-powder coat metal bonding, low surface energy (LSE) bonding tapes and products that can build a durable structural bond without leaving read through. 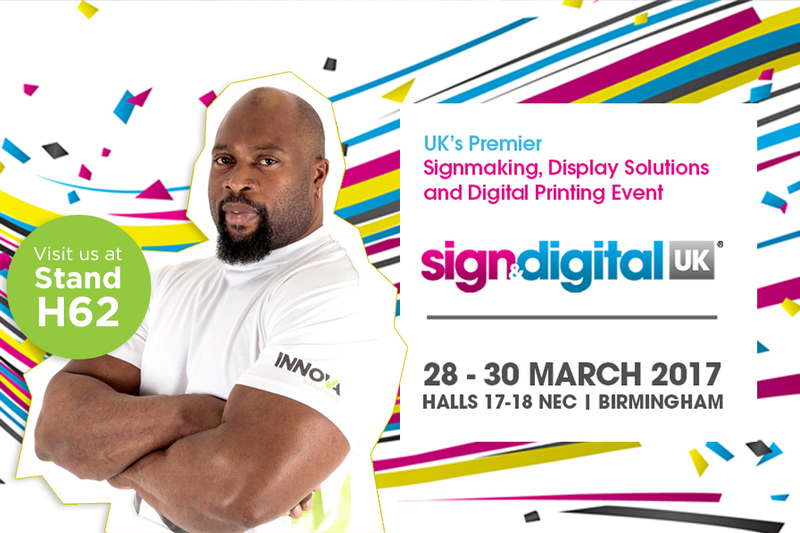 Innova Solutions Limited, who have been making life easier for the signmaker for over 15 years, are thrilled to announce that World Strongman competitor and legend, Mark Felix, will be making an appearance on their stand on Wednesday 29th March. His grip strength is unrivalled in the strongman world, making him the perfect figure to represent the equally impressive unbeatable hold and grip strength of Innova’s products. He personifies the Innova Solutions brand perfectly! Visit their stand to see Felix undertake strength challenges and to have your picture taken with the legend himself. We have utilised Innova Solutions now for best part of ten years and as well as being an efficient, reliable supplier they are a very knowledgeable supplier. We are very often tasked with seemingly impossible ways of fixing certain signs and displays and tapes of various descriptions very often have provided the ideal solution. Sharing the challenge with Innova they always come up trumps with a workable and safe solution. In addition to this, NovaDURA Ltd (Innova’s sister company), will also be at the show to launch a new and exciting product: primaDURA Glow. This is the only anti-vandal and anti-graffiti photoluminescent signage to satisfy the demanding requirements of Transport For London/London Underground Ltd; S1085: Issue A4: 2016 for Fire Safety Performance of Materials in Rail Stations and Tunnels Infrastructure. You’ll also be able to discover more about NovaDURA’s fully recyclable and environmentally friendly signage solutions that come with 10 year warranty for colour/atmospheric degradation and anti-vandal or anti-graffiti properties. They are the solution to your signage, cladding, interpretive panels and street furniture problems.